At no other time in a person’s life will their teeth and mouth change as rapidly as it will between infancy and adolescence. In this short span an entire set of teeth will emerge and then gradually disappear as a second permanent set takes its place. While the process may seem chaotic, there is a natural order to it. Knowing what to expect will help ease any undue concerns you may have about your child's experience. The first primary teeth begin to appear (erupt) in sequence depending on their type. The first are usually the lower central incisors in the very front that erupt around 6-10 months, followed then by the rest of the incisors, first molars and canines (the “eye” teeth). The last to erupt are the primary second molars in the very back of the mouth just before age 3. A similar sequence occurs when they’re lost — the central incisors loosen and fall out around 6-7 years; the second molars are the last to go at 10-12 years. A little “chaos” is normal — but only a little. 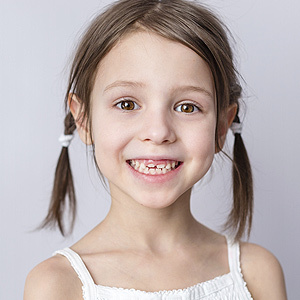 Because of the tremendous changes in the mouth, primary teeth may appear to be going in every direction with noticeable spaces between front teeth. While this is usually not a great concern, it’s still possible future malocclusions (bad bites) may be developing. To monitor this effectively you should begin regular checkups around the child’s first birthday — our trained professional eye can determine if an issue has arisen that should be treated. Protecting primary teeth from tooth decay is another high priority. There’s a temptation to discount the damage decay may do to these teeth because “they’re going to be lost anyway.” But besides their functional role, primary teeth also help guide the developing permanent teeth to erupt in the right position. Losing a primary tooth prematurely might then cause the permanent one to come in misaligned. Preventing tooth decay with daily oral hygiene and regular office visits and cleanings (with possible sealant protection) is a priority. And should decay occur, it’s equally important to preserve the tooth for as long as possible for the sake of the succeeding tooth. Your child’s rapid dental development is part of their journey into adulthood. Keeping a watchful eye on the process and practicing good dental care will ensure this part of the journey is uneventful.